Nagaratna andSuresh N S, a young farmer couple, live in Bandikkoppa village in Thirthahalli taluk of Karnataka’s Shivamogga district. Their small house is surrounded by forests of the Western Ghats. In January last year, both of them fell ill. They had thought it was flu but the fever did not subside even after five days. “So we decided to visit the primary health centre (PHC),” says Nagaratna. At the PHC, they were referred to the taluk government hospital, which sent their blood samples to the National Institute of Virology (NIV) in Pune. Lab tests at NIV confirmed that the couple had Kyasanur forest disease (KFD), a viral haemorrhagic disease similar to Ebola and dengue. 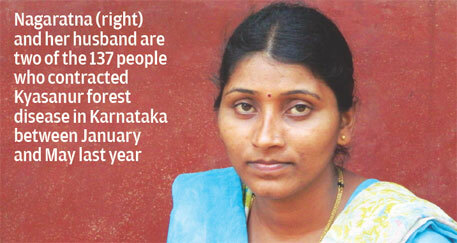 The couple was among the 137 people who suffered from the disease in Karnataka during January-May last year. Except eight, all were from Thirthahalli taluk. It also killed a forest guard in the area. This is the first time since 2003 that such a high number of KFD patients was reported from the state. In 2003, over 300 cases were reported. KFD is not a new disease in the district. The first outbreak was reported in March 1957 after a series of unnatural deaths of monkeys and a mysterious fever engulfed the residents of Kyasanur, a forest village in Sorabataluk. Since then the state has seen frequent outbreaks, but the disease had been restricted to just five districts in the Western Ghats (see ‘Bigger threat’). T Mourya says there was always a suspicion that KFD might be present in other states as well. He says that NIV has in the past found the antibodies against this pathogen in samples collected from Gujarat, Rajasthan, Maharashtra, West Bengal, Tamil Nadu, and Andaman and Nicobar Islands. Mourya’s fears have been proven right as cases of KFD have recently been reported in new areas. In 2014, NIV found six KFD cases amongtribals in the reserved forests of Malappuram district of Kerala. A tribalman in Nedumgayam reserved forest range in Tamil Nadu also died from KFD last December. In 2013, a case was reported from the Mudumalai Tiger Reserve in Tamil Nadu’s Nilgiri district. In November 2012, few human cases were reported from Karnataka’s Bandipur National Park, which also registered the death of a few monkeys by the disease. 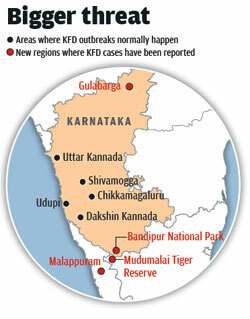 Even within a taluk, outbreaks are not reported from the same area. “The disease keeps moving from one area to another during different epidemic seasons,” says Rajesh Surgihalli, deputy director, Virus Diagnostic Laboratory, Shivamogga, and the state’s nodal officer in-charge of monitoring the disease. Monkeys are the primary carrier of the disease. Ticks (Hemaphysalis spinigera) that live on them, harbour the pathogen and pass it among the monkey population. “Monkeys are sure to die once infected,” says Prakash K S, health officer of Thirthahalli taluk. When infected monkeys die, ticks drop from the dead bodies to the ground, thereby generating hot spots of infectious ticks that further spread the virus. It is transmitted to humans through the bite of a tick or when humans come in contact with an infected animal. 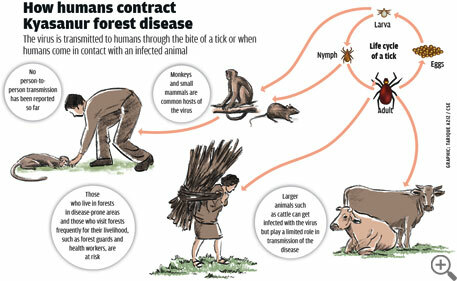 (See ‘Kyasanur forest disease virus ecology’) The outbreak of the disease in humans generally occurs in the dry months, from January to May. Once infected by the virus, it takes three to eight days for symptoms to appear. “Patients may experience abnormally low blood pressure, and low platelet, red blood cell and white blood cell count,” says Prakash. Most patients recover within a week or two. But the illness has a second phase. Only 10-20 per cent patients reach the second phase. “The second wave of symptoms begins from the third week of the illness. These symptoms include fever and neurological disorders,” says Surgihalli. The World Health Organization and the Centres for Disease Control and Prevention have classified this virus into group-4, which means the virus can cause severe human disease and is a serious hazard to laboratory workers. There is no effective treatment for the disease and though a vaccine is available since 1989, it is not popular. At Thirthahalli, only 30 per cent of the people are covered under the vaccination programme as of now. While the vaccine cannot prevent the disease since its efficacy is only 65 per cent, it can completely prevent the second stage of the disease. “That means, the vaccine can prevent deaths,” says Surgihalli. Despite vaccination drives by the government, KFD cases in the state increased between January 1999 and 2005, says a 2006 paper published in Reviews in Medical Virology. The lead researcher, Priyabrata Pattnaik from the Defence Research and Development Establishment in Gwalior, writes that “there is clearly a need for developing an alternative vaccine as well as a rapid diagnostic system for KFD ”. Another issue is that till last year, state health department guidelines allowed KFD vaccination only for the six to 65 age group. The guideline was based on the assumption that children under six and adults above 65 will not visit forests for work. The assumption is meaningless because many disease-prone areas lie within forests or in their vicinity. This year, the authorities have changed the guidelines to include those above 65 in the vaccination programme. But the under-six group is still not vaccinated. The reason: the vaccine has not been tested for its effects on children even though it has been in use for 25 years. None of the government hospitals in Karnataka has laboratories that can carry out tests to diagnose KFD in patients. For conducting the required tests, laboratories need to have high biosafety facilities since there are possibilities of infection. Only one hospital, the private Manipal Medical College, has blood test facilities for KFD in the state. “We are in the process of setting up facilities in the Shivamogga lab. It will be operational in a few months,” says Surgihally. Experts say the government has neglected the disease so far because it was confined to a few areas and has a low fatality rate for humans. Pattnaik, in his paper, writes that the emergence of KFD in various states emphasises the need for nationwide surveillance among animals and humans. EFD seems to be a serious threat. Appropriate steps must be taken by govt and research laboratories before it turns into a monster like EBOLA . Things would be pathetic then, keeping in mind our population density.